On the heights of Alinor, with easy access to the Royal Palace, this splendid mansion was built as a consulate for the Bosmeri Ambassador of the Camoran Dynasty. With the ambassador now in Elden Root, the townhouse is available for you! 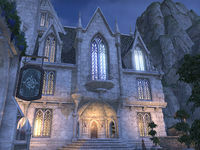 Alinor Crest Townhouse is a large player house in Alinor. This page was last modified on 19 November 2018, at 07:30.